While scientists continue to monitor climate change and the cause and effect on the environment, a new study from the Lawrence Livermore National Laboratory looks at the global water cycle and describes changing patterns of salinity in the world’s oceans over a 50 year period. Their findings suggest changes are occurring faster than previous models predicted and they believe the redistribution of rainfall will affect food availability, stability, access and utilization. 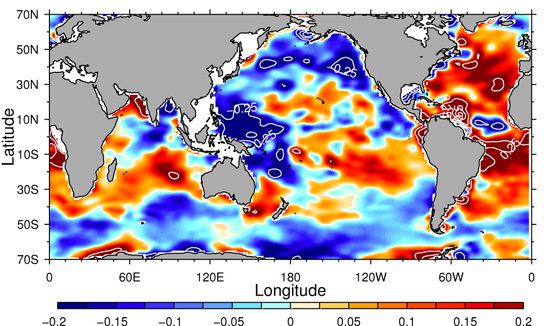 A clear change in salinity has been detected in the world’s oceans, signaling shifts and acceleration in the global rainfall and evaporation cycle tied directly to climate change. In a paper published Friday (April 27) in the journal Science, Australian scientists from the Commonwealth Scientific and Industrial Research Organisation (CSIRO) and Lawrence Livermore National Laboratory reported changing patterns of salinity in the global ocean during the past 50 years, marking a clear symptom of climate change. Lead author Paul Durack said that by looking at observed ocean salinity changes and the relationship between salinity, rainfall and evaporation in climate models, they determined the water cycle has become 4 percent stronger from 1950-2000. This is twice the response projected by current generation global climate models. “These changes suggest that arid regions have become drier and high rainfall regions have become wetter in response to observed global warming,” said Durack, a post-doctoral fellow at Lawrence Livermore National Laboratory. Scientists monitor salinity changes in the world’s oceans to determine where rainfall has increased or decreased. “It provides us with a gauge — a method of monitoring how large-scale patterns of rainfall and evaporation (the climate variables we care most about) are changing,” Durack said. With a projected temperature rise of 3 degrees Celsius by the end of the century, the researchers estimate a 24 percent acceleration of the water cycle is possible. Scientists have struggled to determine coherent estimates of water cycle changes from land-based data because surface observations of rainfall and evaporation are sparse. According to the team, global oceans provide a much clearer picture. “The ocean matters to climate — it stores 97 percent of the world’s water; receives 80 percent of all surface rainfall, and it has absorbed 90 percent of the Earth’s energy increase associated with past atmospheric warming,” said co-author, Richard Matear of CSIRO’s Wealth from Oceans Flagship. He said the intensification is an enhancement in the patterns of exchange between evaporation and rainfall, and with oceans accounting for 71 percent of the global surface area, the change is clearly represented in ocean surface salinity patterns. In the study, the scientists combined 50-year observed global surface salinity changes with changes from global climate models and found “robust evidence of an intensified global water cycle at a rate of about 8 percent per degree of surface warming,” Durack said. Durack said the patterns are not uniform, with regional variations agreeing with the ‘rich get richer’ mechanism, where wet regions get wetter and dry regions drier. He said a change in freshwater availability in response to climate change poses a more significant risk to human societies and ecosystems than warming alone. “Changes to the global water cycle and the corresponding redistribution of rainfall will affect food availability, stability, access and utilization,” Durack said. Susan Wijffels, co-chair of the global Argo project and a co-author on the study, said maintenance of the present fleet of around 3,500 profilers is critical to observing continuing changes to salinity in the upper oceans. The work was funded through the Australian Climate Change Science Program, a joint initiative of the Department of Climate Change and Energy Efficiency, the Bureau of Meteorology and CSIRO. Durack is a graduate of the CSIRO-University of Tasmania Quantitative Marine Science program and he received additional support from CSIRO’s Wealth from Oceans Flagship. Work undertaken at Lawrence Livermore National Laboratory is supported by the U.S. Department of Energy under contract DE-AC52-07NA27344. Be the first to comment on "Changes in Ocean Salinity and the Water Cycle Could Affect Food Supplies"